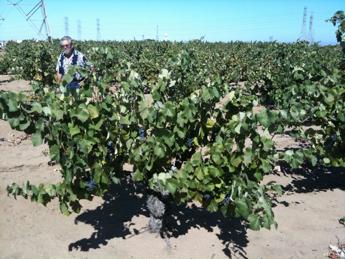 We harvested our Chenin Blanc from a vineyard planted in 1980, on the sandy banks of Mokelumne River. The Clements Hills lie on the far east side of the vast Lodi appellation, as the Sierra Foothills begin their dramatic rise off the valley floor. These Silica and Quartz rich soils are especially suited for producing compelling white wines with grace and presence. 2013 was a record early harvest, due to lower yields and drought. 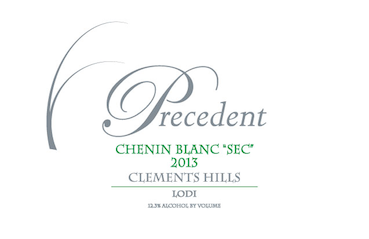 We picked our Chenin Blanc on August 23, at 19.6 brix with great natural acidity (pH 3.3/ TA 6 g/L). A portion of the fruit had transitioned its color from green to gold (a trait particular to Chenin Blanc), giving us the ideal mix of flavor and texture in the finished wine. We chose to whole-cluster press our Chenin Blanc, adding the grapes directly to the press with no crushing or de-stemming. This gave us moderately clean juice the next day which was transferred to older French for indigenous fermentation. Yeast activity became apparent after a few days and took just over 2 months to complete. A natural malo-lactic fermentation ensued. The wine was racked clean to tank in late July. We bottled 250 cases of 750 mLs, unfined and unfiltered on August July 30, 2014. A homeopathic quantity of sulfur was added post MLF and at bottling. Clear, near green-gold in color with aromas of meyer lemon, flint and bees wax. There is great texture and hint of saline minerality to the wines from this area. Bright acidity with medium weight, this is a classic rendition of dry Chenin Blanc that drinks well in its youth, but has enough nerve to merit some cellar time.